Credit the Flyers for being resourceful. How else would you explain their circumvention of a cap space thinner than Jude Law’s hairline? Philadelphia has appeared to have struck gold in not one, but two undrafted free agents from across the pond. Much like the Beatles stormed the States on the Ed Sullivan Show, the Flyers invaded Europe and have Michael Raffl and Pierre-Edouard Bellemare to prove it. Despite spending nearly a decade playing in Austria and Sweden, Michael Raffl found himself on the radar of several NHL scouts throughout the 2012-13 season. Raffl’s 46 point season for Leksands IF of the HockeyAllsvenskn league in Sweden resulted in a two-horse race, pitting the Flyers against the Nashville Predators. Raffl, of course, added to his stock with a standout performance in international play that year as well. The Flyers signed Raffl with the expectation of the six-foot Austrian adjusting to the new ice dimensions in the AHL. But the versatility that caught the eyes of Philadelphia’s brass forced the Flyers’ hand, calling up the 192-pound forward after just two games with the Phantoms in 2013. In his first season on North American soil, Raffl finished up with nine goals and 13 assists in 68 games. And although he was only able to dial up a single assist in Philly’s quarterfinal round against the New York Rangers, the Flyers knew they found a key component to their already dangerous offense. After just two games this season, Raffl was bumped to the top line, replacing Brayden Schenn, who just couldn’t seem to gain any sort of chemistry with Claude Giroux and Jakub Voracek. The natural left winger was an instant fit, finding the back of the net in his first game with his new linemates. As the new look top line continued to gain cohesiveness, Raffl went on a scoring binge of three straight games with a goal, including his first career multi-goal game against the Detroit Red Wings on Oct. 25th. The 25-year-old has also reaped the benefit of an increased workload, which is an obvious result of skating on the team’s top line. And despite seeing only 11:37 worth of ice time in Saturday’s loss to Florida, Raffl has logged 15:00, or more, in eight of Philadelphia’s first 11 games. Michael Raffl’s initial signing may not have turned many heads, especially with Vinny Lecavalier joining the team that summer. But even with the $2.2 million extension, Raffl has found his niche with the Flyers, with his team-leading six goals through 11 games as evidence of his accelerated development in motion. While rookie GM Ron Hextall was limited in the free agent market last summer, the signing of Pierre-Edouard Bellemare is making Hextall look like a mad genius. The 29-year-old Frenchman has been anything but irrelevant through Philadelphia’s first 11 games, providing a spark on whichever line he’s assigned to. 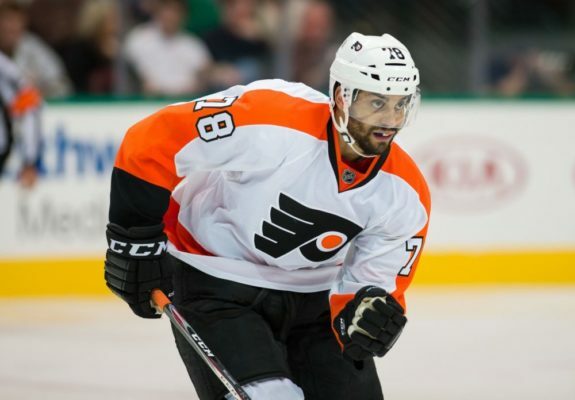 Although Hextall was savvy enough to acquire Bellemare as an undrafted free agent, his rise to NHL prominence comes as no surprise. In five seasons playing in the Swedish Hockey League, the six-foot forward displayed consistent productivity, giving Skellefteå AIK 64 goals and 61 assists in 238 games. Put B. Schenn-Bellemare-Simmonds back together. With Vinny Lecavalier in and out of the lineup, and back in, Bellemare has moved back and forth between the fourth and second lines. And even though his scoring totals through 11 games come out to just a goal and an assist, the Le Blanc-Mesnil native has earned his keep with outstanding skating and two-way play. If defense is what the Flyers were starving for, Bellemare has fed his team. Bellemare’s plus-three rating on a team with a minus-five goal differential gives just a glimpse of how sound he’s been. And to this point, the player fans call, “Pebbles,” has made each of his two points in the NHL count. Bellemare scored his first NHL goal in a pivotal spot on Oct. 22nd in Pittsburgh. The first-year Flyer broke a 1-1 tie in the first period by beating Penguins goalie Marc-Andre Fleury in the first period, stunning the Pittsburgh crowd. Eight days later, Bellemare added his first NHL assist on Wayne Simmonds’ first period equalizer against the Tampa Bay Lightning. With Lecavalier returning to the Flyers lineup, Bellemare has now been demoted back down to Craig Berube’s fourth line. But even with the decrease in ice time that playing on the fourth line brings, Bellemare still brings value in providing energy alongside Zac Rinaldo and Chris VandeVelde. But while Bellemare’s limited NHL sample size brings praise, the two-way center is anything but satisfied with his short body of work to this point. While Bellemare may be his toughest critic, his light scoring is easy to overlook with everything else considered. His 51.8% faceoff percentage is second only to Claude Giroux among teammates who have taken a minimum of 100 draws. 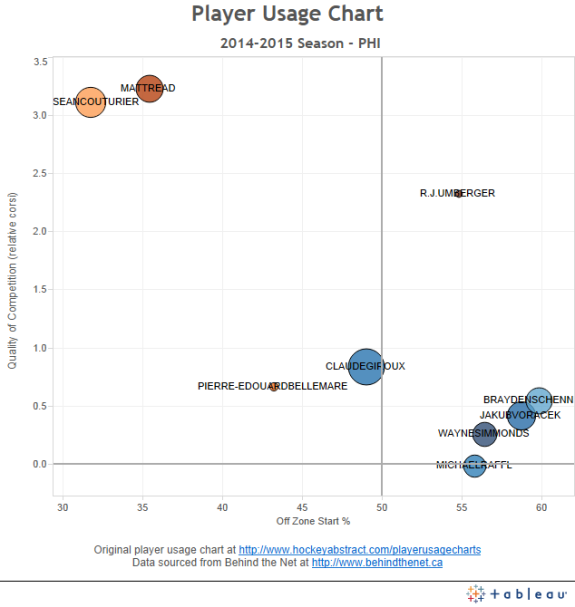 And when it comes to defensive zone starts, only Sean Couturier and Matt Read have a higher percentage. Out of every forward to play in all 11 games for the Flyers, only Sean Couturier and Matt Read have lesser offensive zone start percentages than Pierre-Edouard Bellemare. Leading up to Nov. 4th’s game against Edmonton, Bellemare has seen his ice time reflect the action of a yo-yo. And although it’s not stunning, since he’s been volleyed between the second and fourth lines, his average time on ice of 13:37 is likely to climb with the combination of adjusting to the NHL’s style of play, and the team’s latest increase in penalties. On the surface, the Flyers were bystanders in last summer’s free agency period. But with Raffl already on the roster, adding Bellemare has given the Flyers a chance to compete in a division that doled out top dollar for better known names. And while the household name looks really nice on paper, the Flyers are more interested in value. And with Raffl and Bellemare, value is exactly what they got.